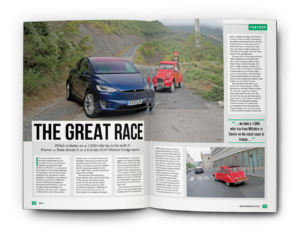 I found ìThe Great Raceî feature in issue 383 very enlightening, with reference to the practicality of long-distance travel in an electric car. I wondered what your take on the story was, and whether you managed to glean any facts and figures from it that add to the picture of electric power for more everyday motoring in Britain. I note that Darren Arthur, the owner of the Tesla Model X, says that he could not afford the fuel costs of an equivalent (diesel) premium SUV, such as a Range Rover. But the fuel costs that he quotes of £400, or 20p a mile for the round trip, when towing a trailer, pale into insignificance against the depreciation of the Tesla, or for that matter the Range Rover, of over £1.00 a mile. Surely this is highly relevant? Interesting thoughts Terence! I was wondering (maybe even hoping?) whether anyone would pick up this fascinating story and ask me what I thought about it. I can barely imagine the utter humiliation of the failure of all that Tesla technology and performance potential to beat a 70 year old CitroÎn 2CV with less than one tenth of the engine power! But then the Tesla was only able to travel for two thirds of the time that it was available, with something like, I calculate, approaching six hours or possibly more on the charger, when the dear old 2CV was clocking up around another 60 miles each time. The Tesla would surely have suffered a severe beating at the hands of a decent diesel car, which would probably use less fuel than the 2CV! I think you’re quite right about the economics though… but people with businesses have an annoying habit of forgetting about car depreciation ñ since it can be written off against profits, thus reducing tax charges ñ although that doesn’t make the reality of those costs of over £1 a mile magically disappear. But let’s look in more detail at the charging and real life range figures. This is an owner who has practical experience of ownership, and who realises that in some situations, such as this sort of long-distance travel, the reality is a usable battery capacity of between 20 and 80 per cent charged. This drops the 257-mile official range down to around 155-miles and, if you’re going to cruise fast, as little as 120-miles. With charging points not conveniently spaced at 60-mile intervals, you could see yourself having to stop as frequently as every 80-minutes of driving for 40-minutes of charging, as they apparently often did. That reality does not require any more emphasis from me… but then if you mainly use your Tesla for a quick blast down the motorway or other fast road of no more than perhaps 100 miles, perhaps to a nice Michelin star restaurant, and are happy to take a leisurely lunch whilst your chariot is prepared for the run home, there’s no problem. Or do I perhaps sound as if I am a touch cynical? I cannot help but also dwell briefly on the “free” charging electricity available to the owners of earlier Teslas (although not for the Model 3 that more closely represents the true potential volume market) which effectively disguises that someone inevitably pays for the fuel, even if it is hidden in the purchase and servicing costs. Plus the no doubt considerable costs of also setting up and maintaining the Tesla charging network. You may be sure that if, in the future, taxation is applied to charging electricity, Tesla will not be paying for that. Bear in mind also that, if such a situation arrives, which I believe it will, it won’t be just taxation of the juice that is used to move the car, and keep its occupants warm or cool, but also the collective charging and energy management losses that, with superfast charging, may amount to another 25 per cent on top of the usable energy. I think I have said enough. Tesla motoring may suit a minority of relatively affluent motorists, but it fails to answer to the wider demands of many ordinary motorists. It is claimed that the “pioneers” of upper market electric motoring are subsidising the development costs of the more ordinary electric vehicles that are hopefully in the pipeline, and I shall probably become as great an enthusiast as any for all-electric motoring when those everyday pollution-beating electric cars begin to appear!